No we never have, we have always been too poor. Also we never really wanted one ….. we have an attitude. Although it’s allegory with which we deal we always felt closer to Duchamp and van Gogh than Courbet. There is a certain literal-mindedness in English culture which associates “work done” with value. What we call the Pre-Raphaelite complex of ‘Never mind the content just count the brushstrokes/rivets’. The meeting point between a Protestant idea of value-for-money and the aristocratic obsession with antiques, we suppose …..
Do you collaborate as some sort of social model? We were never attracted to the heroism attached to the social status of the ‘artist’ or the ‘architect’ either in terms of persecution or celebration. We tried to side-step the issue by inventing a project called Art in Ruins. Maybe it is inevitable given our backgrounds that we should be interested in mongrel culture. Perhaps it is also to be expected that we should adopt a strategy somewhere between the brute force of emotional hooliganism and a cool theoretical detachment. There is no more dramatic way to test the limits of tolerance of our institutional culture and challenge the loneliness of individual freedom than collaboration. Although personally, that is professionally, we never disagree, this does not mean for us that collaboration is a conflict-free zone. In fact far from it. (laughter) To paraphrase the recently resurrected Carl Einstein, the history of art is polemical struggle where each move is an assassination of other possibilities. Everything else is frozen gossip. So why Art in Ruins? “New developments in art are often described in terms that originally were intended as abuse.” This was one reason to choose for ourselves a description that could be interpreted negatively, instead of leaving it to the critics ….. always a blow in advance. Perhaps for some, our project could be seen as simply a continuation of the fascination with decay which runs through English culture. In art, from Sickert through Gilbert & George to Damien Hirst, Rachel Whiteread et al. Although of course we are ourselves ‘morbid symptoms’ – stranded between the overexposed clichés of a dying order and the impossibility of expression of something new – we try to mobilize the ruin in the name of ‘allegory as activism’. That is, the ruin as both a warning sign or reminder, and a possibility for imaginative social reconstruction outside of sentimentality and cynicism. We should make it clear that for us ruins have nothing to do with nostalgia. The newest factory-produced objects are always already ruins. Language, communication, Canary Wharf ….. all ruins. By aligning itself with the concept of progress and suppressing the “allegorical cult of the ruin” modernism aligns itself with technological perfection and consumerist transcendence and ends up as fashion, and fashion for its part reveals if nothing else, that aesthetic experience is democratic. So it’s not art-for-all but ruins for all? Do you have work in public collections? We should say that it may be that it is our extremely visible failure to be indexed in the recent history of the dominant culture that is our greatest success. Perhaps there is the hope that we will calm down and cuddle up to respectability so that we can be flogged off as the last of the British Situationists and enter “the museum of left for dead ideas”. However our achievements so far have sufficient status to ensure that in the future these public institutions will without doubt, be called upon to explain their historical omission. So what’s wrong with elitism? We are against the concept of art as immaculate conception in favour of the dramatisation of the contradictions of everyday life. The idea of pedigree of any sort is only interesting for us when it is asserted as revenge or challenge by the so-called victim. With Punk for instance we can see the contradiction between an extreme form of elitist exclusion and the idea that ‘anyone can do this’. Do you have many enemies? We have a healthy disrespect for art and its social rituals. As ‘uninvited guests’ we believe in a concept of ‘theoretical suicide’ and that enemies guarantee your place in history. It all depends where you’re coming from – not everyone starts out from the same point. It also depends on where you’re going – not everyone has the same objectives ….. or criteria. A great leap forward to one person is an insignificant detail to another. The aim of the avant-garde is to invent its own criteria of success, failure, etc. ….. and therefore reception. Avant-garde culture can only be assimilated into an unchanged status quo as ruins. So you have a “notorious” reputation? We are interested in the complexities of “betrayal” more than in simple transgression. The current success of “bad boy/bad girl” art is for the most part a trompe l’oeil to disguise the fact that almost no-one today breaks “the rules of art”. The difference between a “bad” artist and a so-called “difficult” one, however, is the difference between the picturesque and the avant-garde. It is precisely in the realm of “bad boy/bad girl” activity that we see played out the conflict between biology and social construction. You have to be business-like enough to answer the phone but bad enough to get the call. We posed the question of why struggle to be first-rate when it’s so much more difficult to be second-rate. Heroes are soon forgotten but losers live on. Who are your other influences? All the B’s of course ….. Breton, Benjamin, Baudrillard, Bourdieu, Broodthaers ….. and Genet. Do you think that a lot of your humour is missed? Some years ago when the idiot American Punk band the Ramones first came to Britain a rock journalist interviewed them for the NME. To his serious questions: “Did you go to music school? Do you know the work of Steve Reich and Glenn Branca? Do you know about sound-wave feedback theory?” they replied in that dumb way Warhol would do. The journalist wrote that they were a summary of all that is brilliantly banal about white rock’n roll. When they came back the following year he interviewed them again. Same questions, same response. He wrote that they were a calculated intellectual parody. The following year they came, were even more popular and having still refused to let this journalist ‘behind the scenes’, infuriated, he wrote that in the end they really were dumb and stupid. A few months later the drummer left and an interview appeared where he said that he had gotten tired of playing dumb all the time especially since they had spent so long at music school studying Steve Reich. When they next came to Britain the journalist triumphantly waved the article at them. The Ramones replied that the drummer had not left the group, but that they had thrown him out because he told too many lies. Everyone wants to be on the inside otherwise they take it personally. What should we do, put up a sign saying this is funny? What is the relationship between your public personae and the work? As there is no private life any more there is nothing behind the scenes. All is public, in the sense that the separation between our performance, our lives and our work is blurred and made more complex. We said originally that Art in Ruins was a project and not autobiography but just as we can never be sure when we are joking you are never quite sure what’s a performance. You have also acted as curators? In 1985 we “curated” Our Wonderful Culture which had no selection procedure. Anyone who heard about it could take part and we ended up with sixty participants: fashion students, writers, architects, designers, etc. There was straw on the floor and the whole thing was like an overhung ruined museum; a context which challenged the content of the work, the integrity of the artist and the authority of the artwork and which put the audience on the spot. It was reviewed everywhere partially because we had refused any quality control whatsoever. Some saw it as a model of collaboration whereas we saw it as a ‘site of conflict’. Then for Desire in Ruins at Transmission we installed a shooting gallery and had a local Glaswegian country and western singer performing at the opening. To the sound of Stand by your Man the audience could shoot at white balloons over a repeated image of two children. The image was also used for the posters which were soon torn down by an enraged public. The police eventually turned up and demanded that those remaining were removed from the streets of Glasgow … but the show was already over by then. You have in the past also done a lot of writing? Writing as artists to demonstrate that everyone is a critic has for us always been a performance. Very early on, parallel to our installations – made up (almost) entirely of found objects – we produced a long text Try Another World 5 – made up (almost) entirely of quotes – promoting the idea of unoriginality as radical intervention …..
You have recently been in Berlin on a daad grant. What was it like? When we arrived in Berlin we made an exhibition in a public space called Propaganda as Readymade which focussed attention on the relationship between advertising, celebrity culture, apartheid and ‘solidarity’. It was widely advertised as “new political art from Britain” so all the radical groups flocked to see it and decided that it was “just art”. Of course the artworld also went to see it and decided it was “just politics”. Six weeks later in a private space we did something which as far as we know has never been done before – we repeated the same show, and it provoked outrage. We simply said that propaganda worked through repetition. We were denounced in a new art fanzine which ended up with a great scandal with repercussions all over Germany. 9 A gallery was vandalised and copies of the magazine destroyed. We left a message on an answerphone saying “Get out of town” … So we got the blame. (laughter) The tape was made into an edition to promote the magazine. What is it like to be back in London? 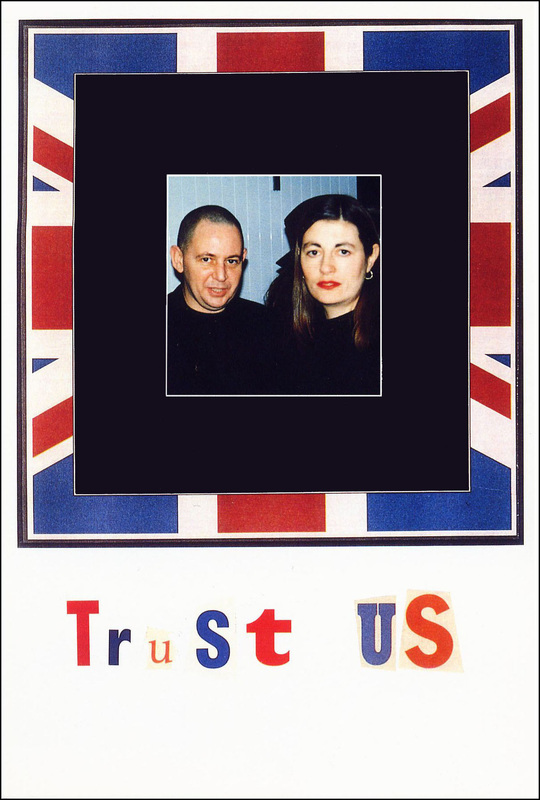 We were thinking of doing a video of “true confessions” entitled ‘Just call us Hannah and Glyn’ but decided that no-one would believe it. We don’t care if our anarchic attitude brings conflict ….. the project of Art in Ruins is a sacrificial monument to an unknown audience. By the way whatever happened to … (inaudible)? © Art in Ruins and Unknown Stranger – London 1994 – an unpublished project for Frieze. Cited as the first usage of the term yBa: “In many ways, the article could be said to have set the tone for much of the critical and curatorial coverage that the ‘new generation of British artists’ has since received abroad, not just in America.” Patricia Bickers in The Brit Pack: Contemporary British Art: The view from abroad. Cornerhouse Communiqué. No. 7 Manchester 1995. 5 Try Another World Polemics, Art Monthly Nos 80/81. Oct/Nov 1984 London, UK. and in Real Life Magazine No. 13. Autumn 1984. New York. Also re-printed in catalogue to Art in Ruins exhibition Lies in Ruins Institute of Contemporary Art London 1986. Edited by artist and writer Thomas Lawson, Real Life Magazine grew out of the Pictures group of artists in New York and went on to include features on and articles by Hans Haacke, Dan Graham, Ken Lum, Jeff Wall, et al. Try Another World is left out of Real Life Magazine: Selected Writings and Projects 1979-1994 published by Primary Information, New York 2007. 6 Les Immatériaux organised by Jean-Francois Lyotard at Centre Georges Pompidou in 1985. 7 c.f. Seduction of Resistant Virgins Art in Ruins on Art & Language. Pilot Issue of Frieze magazine. June 1991. Re-printed as Die Verführung jungfraulichen Wiederstands. A.N.Y.P No. 4 Berlin. 1992. Conceptual review of Art & Language exhibition produced as unofficial consultants to the launch of Frieze magazine. Art & Language did not, as far as we know, become enemies, but graciously conceded that their published reply was not as humorous as our review. 9 “trap” curated by Stephan Geene, BüroBert and Art in Ruins. 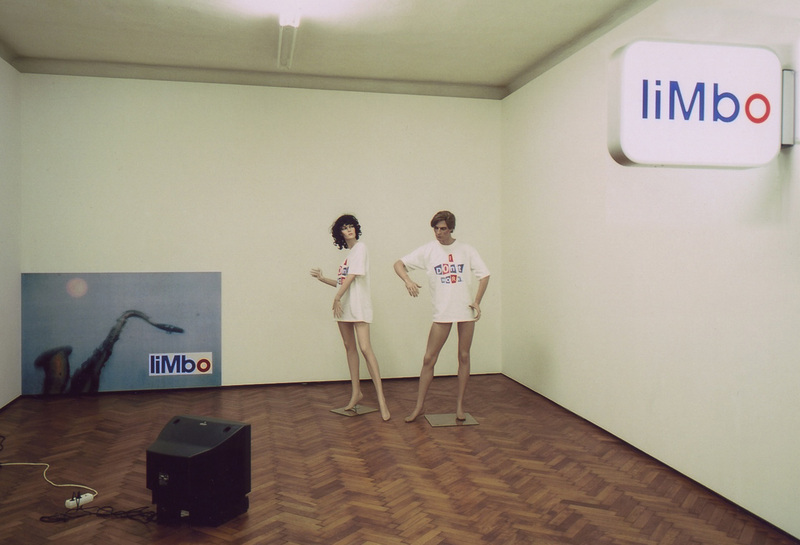 KunstWerke, Berlin 1993. See documentation CopyShop: Kunst Praxis und Politisches “Öffentlichkeit” Ein Sampler von BüroBert. Edition ID-Archive, Berlin/Amsterdam. 1993. Also catalogue to expose, to show, to demonstrate, to inform, to offer: Artistic Practices around 1990 published by Museum Moderne Kunst Stiftung Ludwig Vienna 2015. See also Jorg Heiser. (2006). Between Glamour and Ruin: Low-key Attitudes, High class Expectations in Berlin in the 1990s. in Constructing New Berlin: Contemporary Art. Bass Museum of Art and Phoenix Art Museum. Munich. Prestel. 10 That is, participatory democracy, of course. a. A region on the border of Hell. b. Hell, Hades. 1637.
c. Prison, durance. 1590. d. Any unfavourable place or condition, likened to Limbo. 1642. e. Used technically in literal sense of ‘border’ or ‘edge’. 1671. f. a zombie-like condition. as a result of reflection on intention and its outcome (ironic, comic, tragic, etc.). b. a social condition. 1. everyday life (the present) as a state of Limbo (between an unfinished history, memory, etc., and the construction of a future). 2. 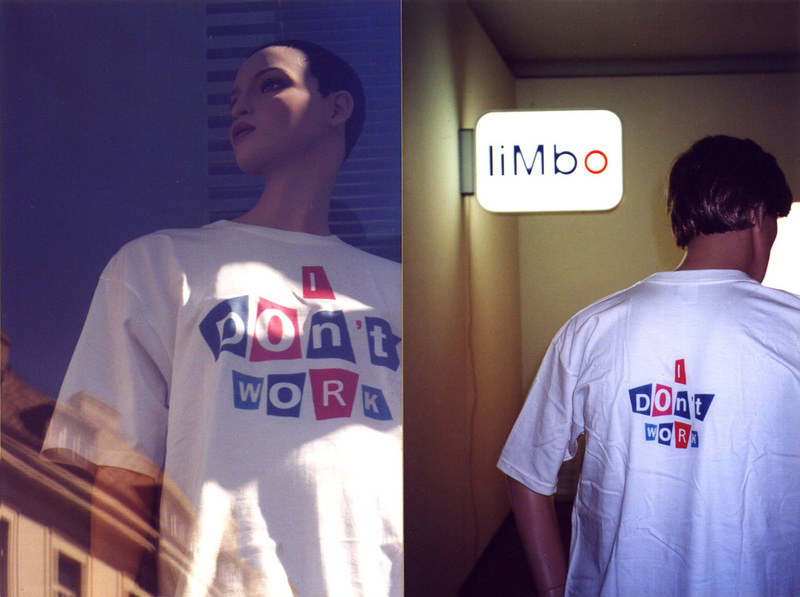 Limbo as a result of Lost Reputation. Moore. e. as a result of historical amnesia or a contemporary blindspot. f. a positive condition (uncommon usage). Productive withdrawal.